At a press conference last week, Mary Norine Walsh, vice president of the American College of Cardiology, said that breast cancer and heart disease screening at one time could be considered a “two-fer” for women. She was highlighting a research paper that’s just been published in JACC: Cardiovascular Imaging entitled “Digital mammography and screening for coronary artery disease.” Laurie Margolies and her colleagues from the Icahn School of Medicine in New York City sought to determine if breast arterial calcification (BAC) based on digital mammography could predict coronary artery calcification (CAC). Prior studies had shown that BAC could be an early sign of atherosclerosis, the buildup on the arterial walls of fat, cholesterol and plaque. The researchers evaluated 292 women using full-field digital mammography and non-contrast computed tomography (CT) of the heart. 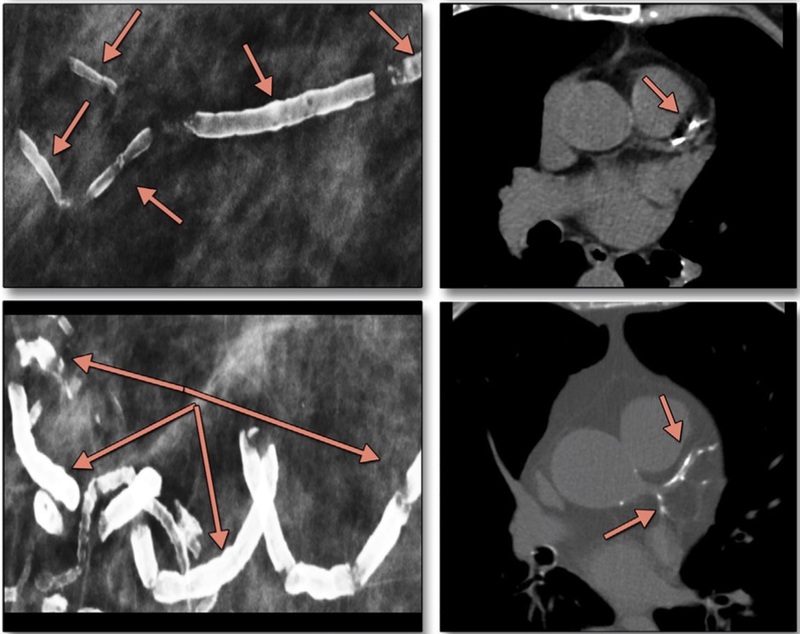 Both BAC and CAC were estimated on a score of 0 to 12: the image below (© JACC: Cardiovascular Imaging) illustrates scores of 9 (top row) and 12 (bottom row) for BAC (left) and CAC (right). They were correlated with each other and with standard cardiovascular risk factors: the Framington Risk Score and the Pooled Cohort Equations. Margolies et al. found that 70% of women with BAC also had CAC, suggesting they should be monitored closely for potential strokes and myocardial infarctions. She commented: “Women should ask their radiologists if there was any calcification in their arteries. This information can then be given to their primary care doctors to be used in conjunction with standard risk factors to determine if further evaluation, or treatment, would be of benefit.” BAC was superior to the standard cardiovascular risk factors and, remarkably, there were very few false positives when mammography was used to predict heart disease. Harvey Hecht, the senior author of the study and director of cardiovascular imaging at Mount Sinai St Luke’s Hospital, commented: “Based on our data, if a mammogram shows breast arterial calcifications it can be a red flag – an ‘aha’ moment – that there is a strong possibility she also has plaque in her coronary arteries.” In an accompanying editorial, Nasir and McEvoy called for the widespread documentation of BAC in breast screening reports, improving the education of radiologists and primary care doctors, and stimulating further research in the field. The American Cancer Society estimates that each year breast cancer claims the lives of 40,000 women in the USA. However, it’s not the main killer. Cardiovascular disease annually takes the lives of almost 300,000 American women. And mammography could play a role in reducing both those numbers.